When we think of the Saharan Desert, we usually think of sand and heat, not livestock! The drought resistant and incredibly hardy Sahelian Goats are raised in Saharan and sub-Saharan regions! They are truly a miracle of survival and efficiency!Sahelian Goats are generally kept in herds, in vastly extensive systems. These goats are very rarely sheltered and are most often left to graze without supplemental feeding. Often, they are kept in herds along with sheep. Sahelian Goats are very hardy and have adapted to great many regions of western Africa. They do well on little food and water and are heatproof! Usually, Sahelian bucks weigh 85 to 125 pounds at maturity and stand between 65 and 85 centimeters at the withers. Does follow at around 70 centimeters in height and 55 to 75 pounds of weight. Sahelian Goats tend to have the appearance of having rather unsubstantial bodies with extremely long legs. They have horns and most have wattles. Sahelian Goats have pendent or horizontally carried ears. The hair of Sahelian Goats is short and stiff to the touch. They come in any variety of colors, ranging from solid white to solid red or black, and often may be sprinkled, speckled or pied! The udder and the scrotum are divided into halves. Usually, Sahelian Goats are slaughtered at 25 to 30 kilograms, and the carcass yield is about 50 percent. In a lactation period of 120 days, Sahelian does will produce about 70 kilograms of milk, beginning with a heavy flow for the first week and sloping off in subsequent weeks. The origins of Sahelian Goats are obscure, but it is certain that they have been herded by pastoralists for centuries. They are used for their meat and for their skins, and quite rarely their milk will be used. Sahelian Goats are a type widespread throughout Western or Saharan Africa, and are adapted to various regions in a variety of types. They remain extremely important to nomadic herders. They are known in various regions as Nioro Goats, Fulani, Sahel, Sahélienne,Cheèvre bariolée, West African Longlegged, Gorane, Balami and Niafounké. 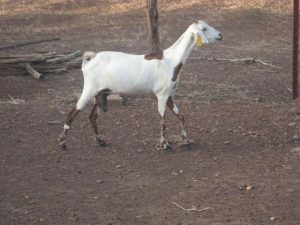 Sahelian Goats need very little care; most live in a semi-feral state. They are usually kept in nomadic herds along with sheep or other goats. Very rarely are herds larger than a few dozen small ruminants.Usually, Sahelian Goats have their first kids at 18 months of age. Twins and singlets are most common. Singlets are born larger and gain faster than kids. Mothers are usually able to produce more than enough milk for their litters, though milk production varies with age, litter size and the progression of the lactation.